"29 June 2015. Bangkok, Thailand: After 10 years of hard work that has taken them to the top of the heap in the Thai music world, Slot Machine the kingdom’s top rock band is now ready to take on the world with their first international release, ‘Give I"
29 June 2015. Bangkok, Thailand: After 10 years of hard work that has taken them to the top of the heap in the Thai music world, Slot Machine the kingdom’s top rock band is now ready to take on the world with their first international release, ‘Give It All To You.’ The song is the first taste of the album the band has completed with world-renowned and six-time Grammy Award-winning producer Steve Lillywhite, whose credits include U2, The Rolling Stones and The Killers. That album – Spin The World - will be released in 2016 and the band is ready for the challenge of taking on the competitive international music market. “As an artist and musician, it’s very challenging for us to work at the international level but Steve has given our music and songs a new dimension. ‘Give It All To You’ is ready for an international audience as well as for the Thai fans and I’m sure they’ll be proud of us,” said lead singer Foet. 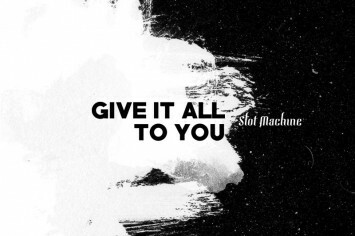 ‘Give It All To You’ will be released on 27 July throughout Australasia including Australia, China, Hong Kong, India, Indonesia, Korea, Malaysia, the Middle East, the Philippines, Singapore, Taiwan, and Thailand. Slot Machine also plans to embark on an Asian tour to promote Spin The World, starting with a full show at the Super Slippa Festival at Taipei Arena in Taiwan on 9 August 2015.